Hierarchical crowdsourcing networks (HCNs) provide a useful mechanism for social mobilization. However, spontaneous evolution of the complex resource allocation dynamics can lead to undesirable herding behaviours in which a small group of reputable workers are overloaded while leaving other workers idle. 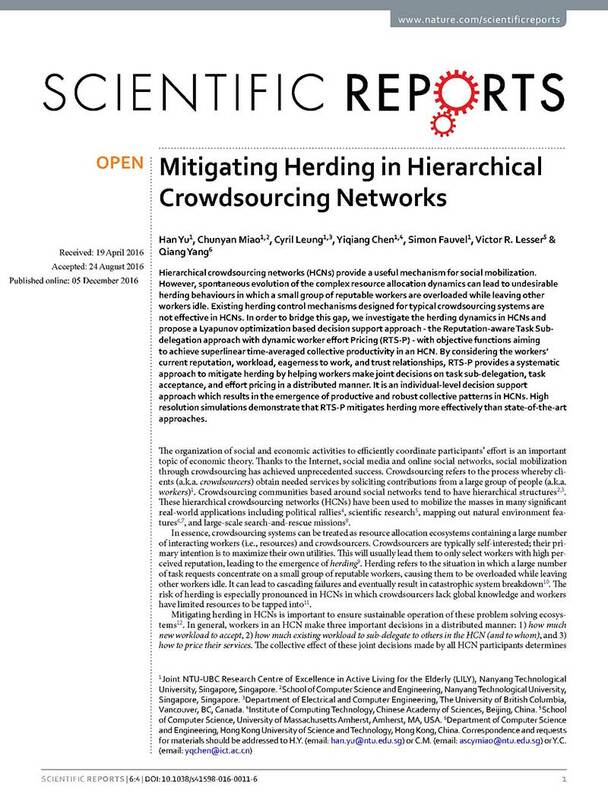 Existing herding control mechanisms designed for typical crowdsourcing systems are not effective in HCNs. In order to bridge this gap, we investigate the herding dynamics in HCNs and propose a Lyapunov optimization based decision support approach – the Reputation-aware Task Sub-delegation approach with dynamic worker effort Pricing (RTS-P) – with objective functions aiming to achieve superlinear time-averaged collective productivity in an HCN. By considering the workers’ current reputation, workload, eagerness to work, and trust relationships, RTS-P provides a systematic approach to mitigate herding by helping workers make joint decisions on task sub-delegation, task acceptance, and effort pricing in a distributed manner. It is an individual-level decision support approach which results in the emergence of productive and robust collective patterns in HCNs. High resolution simulations demonstrate that RTS-P mitigates herding more effectively than state-of-the-art approaches.